Preheat oven to 400 degrees. Coat a donut pan with cooking spray. Place brown sugar and melted butter/oil in the bowl of a stand mixer fitted with the paddle attachment. Whisk together until combined. While mixer is running, add the egg, milk, pineapple and vanilla extract until combined. In a separate bowl, whisk together oat flour, rolled oats, baking powder, cinnamon, salt and nutmeg until combined. While mixer is running, add dry ingredients into wet ingredients and mix until combined. Fold in the grated carrot. Fill donut cups with donut mixture, pressing it down into the cup with the back of a spoon and filling to the top, leaving a hole in the center. Bake in preheated oven for 12-13 minutes, until toothpick inserted in the center comes out clean. Allow to cool slightly, then transfer donuts to parchment paper and allow to completely cool. 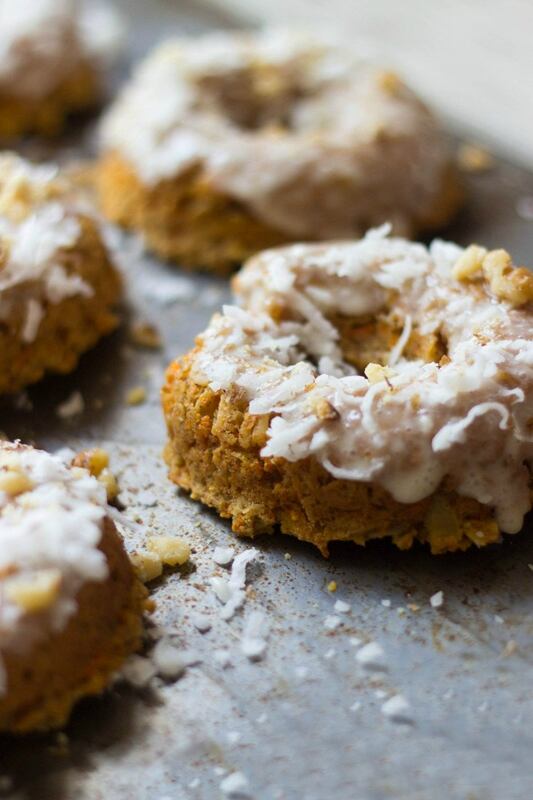 While donuts bake, whisk together cream cheese, coconut milk, powdered sugar and vanilla extract. Place in the refrigerator until donuts are cooled. Coat donuts with glaze, sprinkle with toppings and allow to dry.